Disclosure: I was sent review copies from the vendor in order to write up an honest review. All views shared are mine and mine alone. Check Out These Two New Releases from Just Imagine & Play! 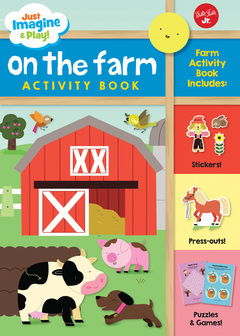 Includes Stickers, Punch Out Activities and More! If you have little ones, ages 3-6, who love stickers and activity books, then you will want to check these two new sticker activity books from the popular "Just Imagine and Play" series. Kids can have fun on the farm or on a construction site. I received samples of these activity books and couldn't wait to see what my girls thought of them. Savannah, the animal lover chose "On the Farm", partly because it had a dog on the front cover, and she loves dogs. 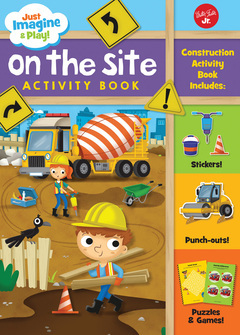 Bella, didn't mind, as she like construction sites and loved seeing a girl construction worker on the cover of her activity book. This was the first time my girls experienced these activity books from Just Imagine & Play!. They were excited to find not only stickers in the book, but also punch out activities and even puzzles and games, to go along with the themes of farm animals and construction sites. As a parent, I love interactive books like these that keep kids busy with fun and games, but also share fun facts along the way. Savannah had fun learning about the different animals you would find on a farm, while Bella shared all about construction sites and the different vehicles used to get specific jobs done. My girls loved these activity books, and have asked for me. I will definitely be picking up past releases to put away and surprise them at Christmas. I also see these fun activity books coming in handy on rainy or snowy days, when the girls want something fun to do on their own. "Have you ever wondered what life is like on the farm? Find out with this fun and sunny interactive activity book! Unfold this book, and there's your stand-up play scene. Customize your farm with the reusable stickers and punch-out, stand-up characters, and you're ready for action. What kinds of animals you have on your farm and what you grow is up to you! Gather eggs, feed the pigs, milk the cows, plant the crops; it's never a dull day on the farm! 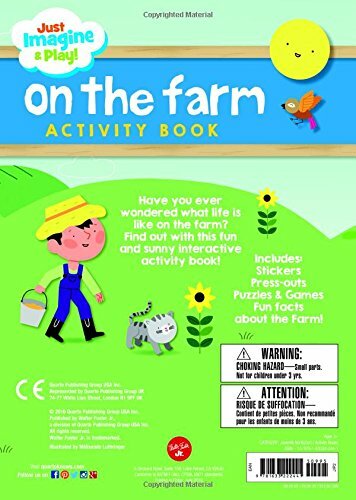 Includes a 48-page activity book with cool facts about farm vehicles and animals, puzzles, and games, plus punch-out characters, reusable stickers, and a fold-out barnyard scene." Welcome to the bustling construction site! "Have you ever wanted to be in charge of your own construction site? With this awesome interactive activity book, you can! Unfold this book, and there's your stand-up play scene. Customize your construction site with the reusable stickers and punch-out, stand-up characters, and you're ready for action! What you build on your construction site is up to you! Use dump trucks, excavators and bulldozers to move dirt and build houses and skyscrapers. 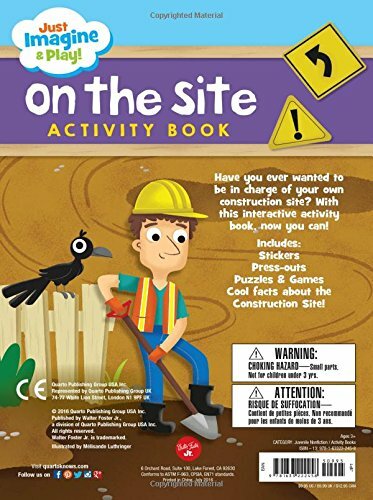 Includes a 48-page activity book with cool facts about construction tools and vehicles, puzzles, and games, plus the punch-out characters, reusable stickers, and a fold-out construction site scene." Mattia Cerato has illustrated many books including Sticker, Punch-out & Play! : Construction; Sticker, Punch-out & Play! :Dinosaurs; and Just Imagine & Play: On the Site. He resides in Turin, Italy. Melisande Luthringer always wanted to be an illustrator or an astronaut. This explains why, when she isn't drawing, she has her head in the clouds. She works mainly in advertising and editorial illustration with occasional children's commissions, which she loves the most. In addition to Quarto Publishing Group, she is published by Random House UK, and Usborne.